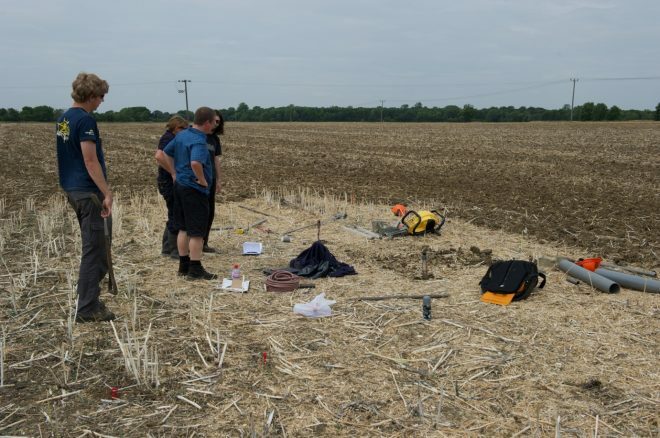 Van Walt is delighted to have supplied equipment for the Dart Project (Detection of Archaeological Residues using remote sensing Techniques), research led by the School of Computing at the University of Leeds which plans to ‘revolutionise effective use of state-of-the-art remote sensing technology’ to see beneath the soil to uncover the past. Archaeology is no longer just about digging holes which can potentially damage sites of specific interest. This is a three year project backed by the Science and Heritage programme which is funded jointly by the Arts and Humanities Research Council (AHRC) and the Engineering and Physical Sciences Research Council (EPSRC) and brings together the areas of computer vision, geophysics, remote sensing, knowledge engineering and soil science to examine the complex problem of heritage detection. We have provided TDR soil moisture sensor technology, including a new soil profiling probe and liner sampling sets to assist the team. TDR is an established technique used by soil scientists to establish water content in the soil. Its advantages are it is cost effective, accurate, repeatable and it can be left onsite to give constant measurements. Data from the site can be viewed here and updates on the project can be found on the Blogs of Dan Boddice, Birmingham based PhD student and Ant Beck DART Project Champion and Research Fellow in the School of Computing at the University of Leeds.